Car camping is great for beginners because you can drive all of your stuff to a campsite instead of carry it on your back, the amount of stuff you can bring is only limited by space in your car, and it’s easy to throw everything back in the car and bail if things “go bad”. Note: Since deciding to write this article, it’s come to my attention that not everyone understands what the term “car camping” means. According to the Oxford Dictionary, car camping is “A type of camping which involves driving rather than walking to a campsite.” A longer definition is “Car camping… means that you load up all of your gear for the trip in your car, pull into your campsite, and set up your tent on a designated tent pad.” (source) Some people take the term to mean sleeping in your car but that’s not what I’m talking about here…. but I will probably write about that later this summer. I’ve been camping for a lot of years. I’ve camped overnight in the woods on long hiking trips; I’ve camped several days at a music festival; I’ve been car camping for several days to a week at a time; and I lived in a tent for most of two summers when I was a wildland firefighter. Truthfully, I’ve forgotten what it’s like to be a beginner camper. Earlier this year, my friend went on one of her first car camping trips. Except for her dogs, she was by herself too. She told me how my solo camping trips with Gretel inspired her and gave her the courage to try it on her own. I was so proud of her. She never mentioned to me that she reserved a tent-only campsite but, honestly, I wouldn’t have thought to “warn” her anyway. 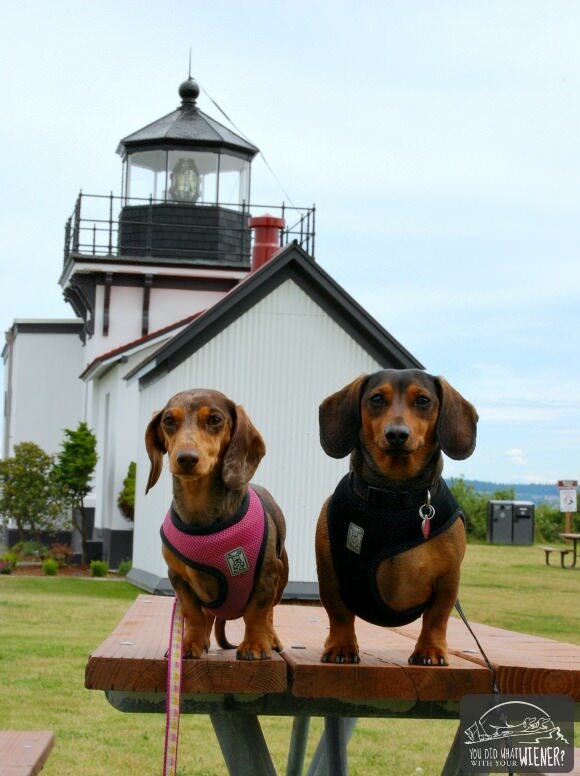 Her experience made me think though – what would I tell someone if they were going car camping for the first time with their dog? Car camping is different than other types of camping because weight and the amount of stuff you pack is not an issue. You can load up your car with whatever will fit and drive it to the campsite to unload so you can afford all sorts of luxuries you can’t when you hike all of your camping stuff into the woods. It’s the “luxury” camping experience in my book. Most people’s first camping experience is car camping. I decided to sit down and do a brain dump of things I’ve learned over the years that I would tell someone new to the car experience. It turns out I had a LOT to say so I broke the information up into several articles. This one is about selecting a campsite and setting up camp. I’ll write later about things what to bring, general considerations, and etiquette. In the meantime, if you have a burning question, please leave it in the comments below. 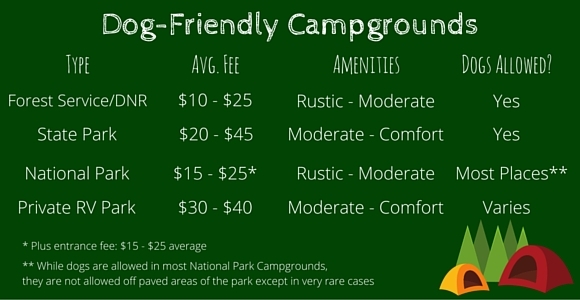 There are several different types of campgrounds. It’s best to research where you will be staying before you go but, if you are like us, sometimes it’s a stop on a road trip or something spontaneous. Knowing the basics of each campground type can help you decide where to start searching and know what you might expect if it’s a spontaneous stop. The Department of Natural Resources (DNR), like the Forest Service, manages public lands that are not designated State or National Parks. A lot of forest service areas allow what they call “dispersed camping” which means you can pitch your tent wherever you want as long as you follow a few rules. There is no fee for this kind of camping but there won’t be any services or amenities either like trash removal, restrooms, water, fire pits, or picnic tables. As a beginner camper I would avoid dispersed camping but it’s good to know about the option. I’ve pulled into forest service land many times on road trips for a quick, easy overnight place to stay. “Rustic amenities” means that there at least an outhouse in the campground and a picnic table and fire pit at your campsite. There may or may not be garbage service at the campsite. “Moderate amenities” are a step up. The campground usually has flush toilets and will have water and garbage service. The campsite is usually a little more maintained too – the picnic tables might be in better shape and there might be nicely prepared spot for your tent. You MAY find electrical and water hookups for an RV. “Comfort amenities” means you will likely find all of the above stuff plus showers and electrical/water hookups for RVs. At private campgrounds, you may find WiFi, small convenience stores, and other individual perks like an off-leash dog run, rec center, or pool. The #1 thing you need to know is if dogs are allowed in the campground or not. 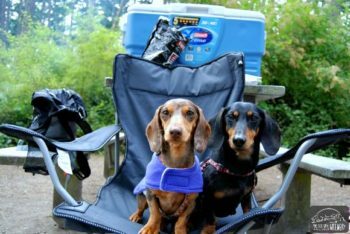 Thankfully, most campgrounds do allow dogs – even many in National Parks – but it’s always good to make sure. You can double check by looking at the website, calling (although many campgrounds are not regularly staffed), or showing up and checking for “no dog” signs. If there aren’t any, then you can assume dogs are allowed. Don’t expect a lot of privacy at campgrounds you can drive to. They are often crowded and camp spots are situated right next to each other. If you are lucky, there will be some trees in between you and your neighbors. You will have better luck finding privacy at Forest Service campgrounds. Little nor no privacy doesn’t mean no fun though. People usually do a pretty good job of keeping to themselves and it can be really fun to get to know your temporary neighbor. Many campgrounds require reservations. State Parks and Private campgrounds almost certainly do. Some Forest Service and National Park campgrounds also allow reservations. Reservations at popular parks can fill up a year in advance. Many parks set aside some campsites to be used on a first-come-first-served basis and some will release the reserved sites if campers don’t check in by a certain time in the evening. If a campground says “full”, you can always check. “Walk-in sites” mean you will have to park and walk from your car to where you will camp. This walk can be a couple hundred feet up to 1/2 mile. If you reserve a walk-in site, be prepared to carry your stuff and/or bring a folding wagon to help you carry it. Some areas require a parking pass to use the land. A 24-hour pass is usually included in the camping fee but may not be valid before or after checkout time. If you plan to spend more time in the area, double check for signs that you need to purchase an additional day-use or annual pass. Gathering wood for a fire from a campground is prohibited in almost all places. Some campgrounds have firewood available for sale at the entrance station or from the camp hose but there is no guarantee they do or that there will be any left when you get there. It’s best to bring it from home (UPDATE: I WAS INFORMED BY AN AVID CAMPER FRIEND THAT IT IS NO LONGER OK TO BRING FIREWOOD FROM HOME. SEE WHY HERE) or buy it from a store on the way to the campsite. You will almost never find paper for fire starter there so bring some from home and bring your own kindling, or hatchet to make kindling, from home. The majority of campsites are near recreation areas or historical sites but not all are. That’s great for exploring and giving your pooch some exercise in the evening. Just make sure your dog is allowed (ex. not allowed in National Parks or some wildlife refuges) in the area before venturing out. Did these tips spark any questions or do you have tips to add? Leave a comment. But I do love the idea of camping. wow, this is really nice. I like to use a car for camping. There are some really good ways to use it, I am glad I read this. I’ve found that state parks offer some of the best camping around.. They’re in ver y beautiful areas, and the sites are spread out so that you don’t have to touch noses with your neighbor every time you go outside. Thanks. My friend just pointed that out and I edited the article. Personally, I’ve never heard of it being an issue or seen signs but it makes sense. Part of it might be that, while I used to car camp a lot, my camping the last few years has been primarily during backpacking trips. I know that tree diseases and bugs have become a huge issue in some areas in more recent years. We’ve been car camping a little more since Gretel go injured so maybe I’ll run into one of those signs soon. I used to love to go car camping with my little shih tzu and he loved every minute. I have not done so yet, but I even know of someone who camps with their cat! I look forward to your future articles on camping with dogs. I love seeing all of the photos of cats hiking and camping on the internet. I walked my cat on a leash over 30 years ago when you were still a freak for doing it. Ha, ha. Great suggestion. That’s already on my list for July (Lost Pet Prevention Month). That’s such a sad story. Unfortunately, it happens a lot more than it should. I’ll keep this story in mind for the article. Thanks. My huMom has not taken me camping because earlier in our relationship I would seizure when we traveled but she used to camp with her dogs Chelsey, Desta & The Mighty Moo. Apparently, they loved it! We have pawsome parks around here that we can do in a day; it’s safer for me. We are Van campers and love it. Our dogs have been with so for many, many miles and trip after trip. They are a bit spoiled; I don’t think they even remember their maybe 2 times in a tent. Thanks for the graeat article!